NOTICE: Activation key must be used on a valid Steam account. Requires an internet connection. About the game Welcome To Columbia. The year is 1912. With the United States emerging as a world power, the floating City of Columbia is a mighty symbol of American ideals, launched with great fanfare to the cheers of a captivated public. But what begi… ns as an endeavour of hope soon turns to disaster, as the city disappears into the clouds, its whereabouts unknown. The greatest accomplishment in American history has vanished without a trace. The player assumes the role of former Pinkerton agent Booker DeWitt, sent to Columbia to rescue Elizabeth, a young woman imprisoned there since childhood. He will develop a relationship with Elizabeth, augmenting his abilities with hers so the pair may escape from a city that is literally falling from the sky. DeWitt will learn to fight foes in high-speed Sky-Line battles, engage in combat both indoors and amongst the clouds, and harness the power of dozens of new weapons and abilities. System Requirements Windows - Minimum OS : Windows Vista Service Pack 2 32-bit Processor : Intel Core 2 DUO 2.4 GHz / AMD Athlon X2 2.7 GHz Memory : 2 GB RAM Hard Drive : 20 GB available space Graphics : DirectX10 Compatible ATI Radeon HD 3870 / NVIDIA 8800 GT / Intel HD 3000 Integrated Graphics Sound card : DirectX Compatible Video Card Memory : 512 MB Other requirements & supports : Initial installation requires one-time broadband internet connection for Steam authentication and Platform Update For Windows Vista (KB 971644 required on Vista only for DirectX 11); software installations required (included with the game) include Steam Client, Microsoft DirectX Runtime, Microsoft Visual C++ Redistributable 2008 SP1, and Microsoft Visual C++ Redistributable 2010 SP1. Windows - Recommended OS : Windows 7 Service Pack 1 64-bit Processor : Quad Core Processor Memory : 4 GB RAM Hard Drive : 30 GB available space Graphics : DirectX11 Compatible, AMD Radeon HD 6950 / NVIDIA GeForce GTX 560 Sound card : DirectX-Compatible Video Card Memory : 1024 MB © 2002-2012, Take-Two Interactive Software, Inc. Developed by Irrational Games. 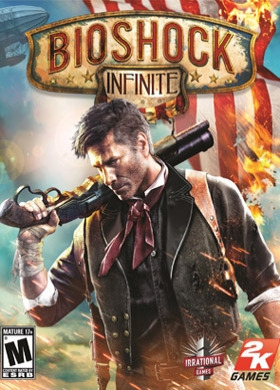 BioShock, BioShock Infinite, BioShock Infinite: Industrial Revolution, Irrational Games, 2K Games and their respective logos are trademarks of Take-Two Interactive Software, Inc. The ratings icon is a trademark of the Entertainment Software Association. All other trademarks are property of their respective owners.